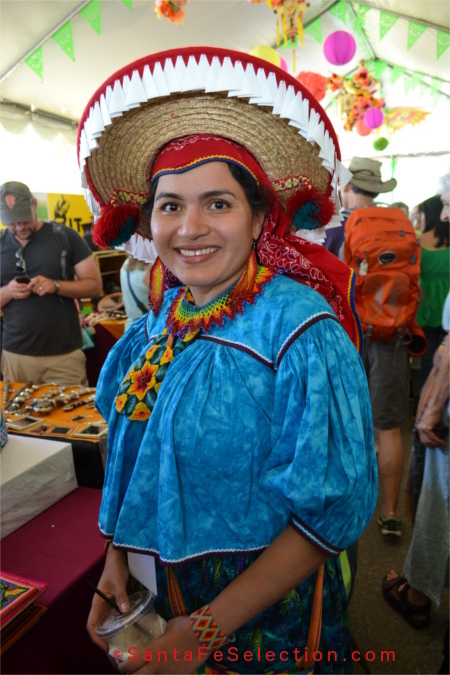 Each year, the Santa Fe International Folk Art Market brings to town an amazing display of folk art from around the world. As many as 143 display booths cover Milner Plaza at Museum Hill. Thousands of visitors flock to explore the wonderful art from continents near and far. 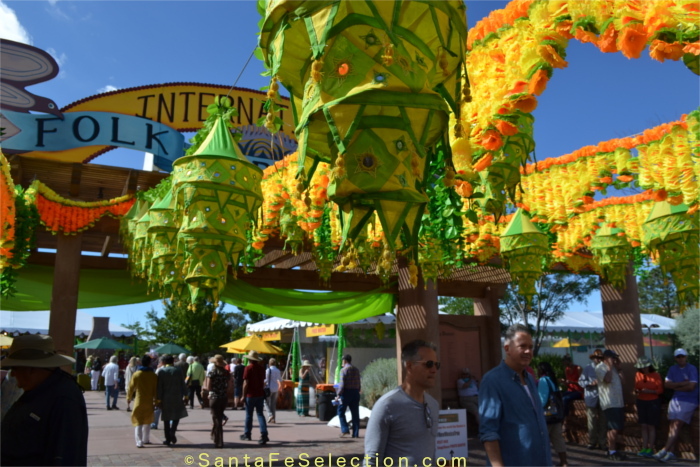 Santa Fe International Folk Art Market Entrance, 2015. This is just one side of one tent of booths at the market on Museum Hill. 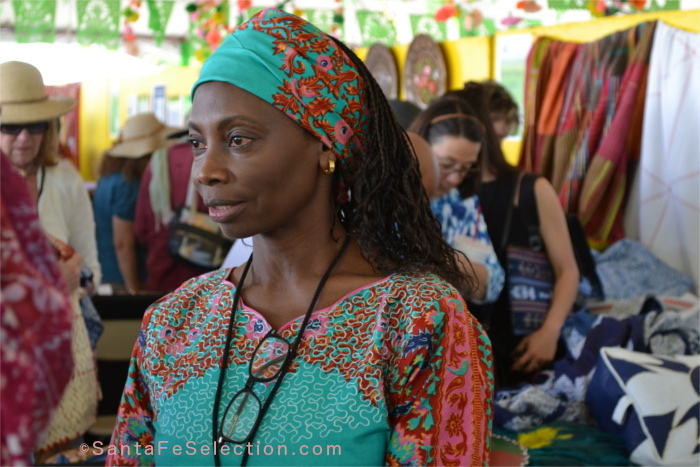 As I wandered through a sea of folk, from booth to booth, country to country, I was struck by the beauty and uniqueness of the myriad faces of the artists and representatives. 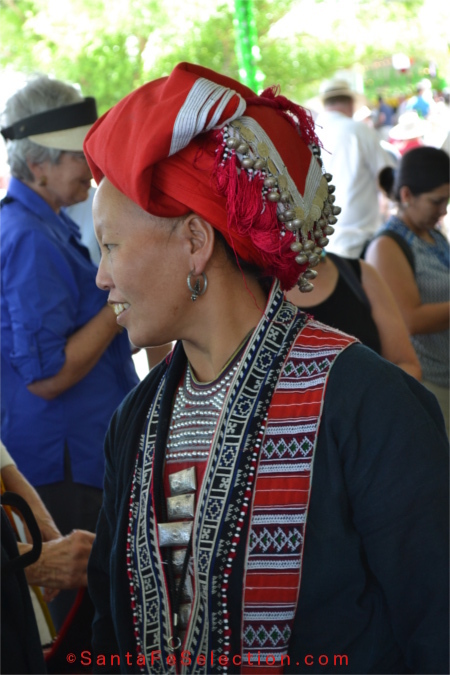 Many wore traditional dress that tells something of their art and culture. 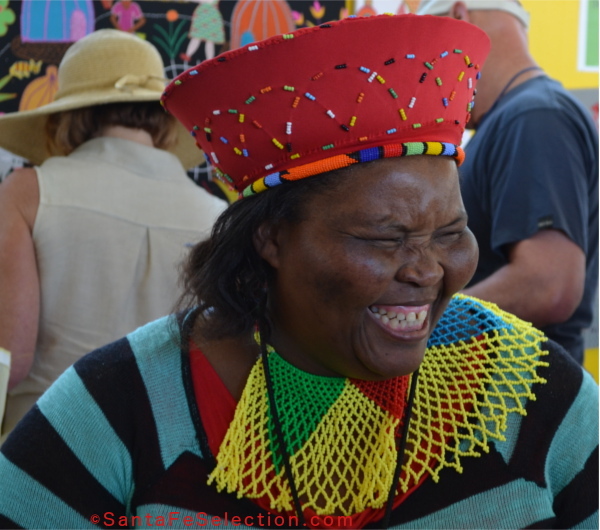 For those of us with a traveler’s spirit, it’s nice to stir appreciation for the cultural diversity that still exits in today’s increasingly “global” environment. I took hundreds of photos but here are a select few to take you around the world. I hope you enjoy the trip. Vietnam – Ta May Ly. 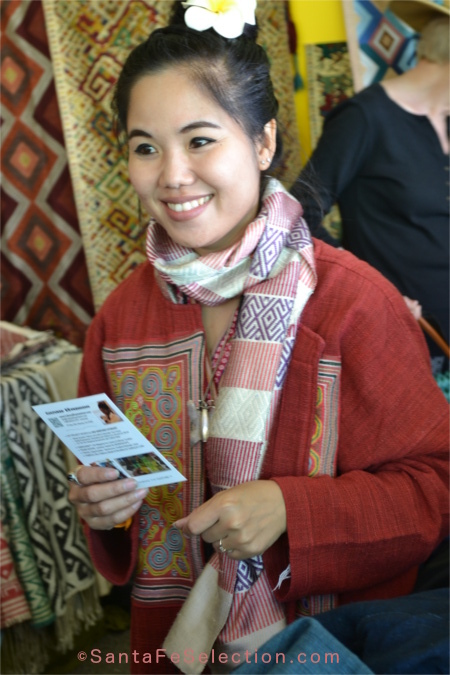 Red Dao embroidered textiles, tunics, clothing, bridal and ceremonial scarves, headdresses, hats, necklaces. 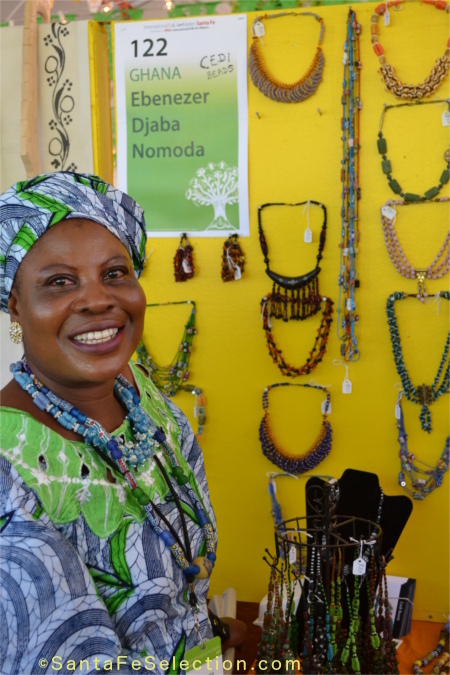 Ghana – Recycled glass beads from bottles symbolize wealth and status in Krobo culture. 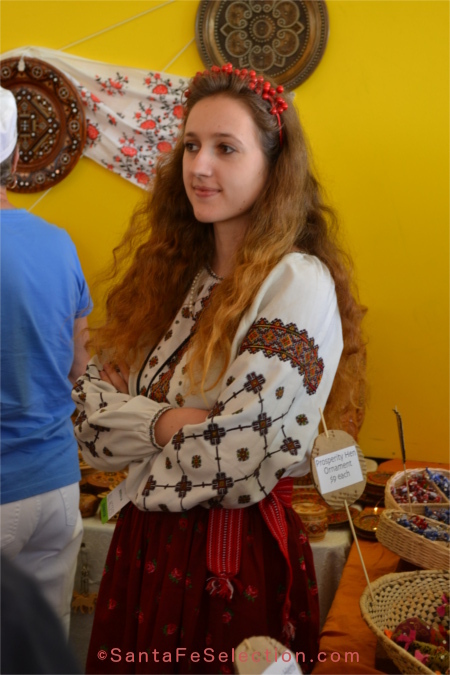 Transylvanian-Hungarian painted and carved furniture, home accessories and crosses. Kazakhstan-Kazakh jewelry; carved, ornamented boxes, mirrors and hair ornaments. 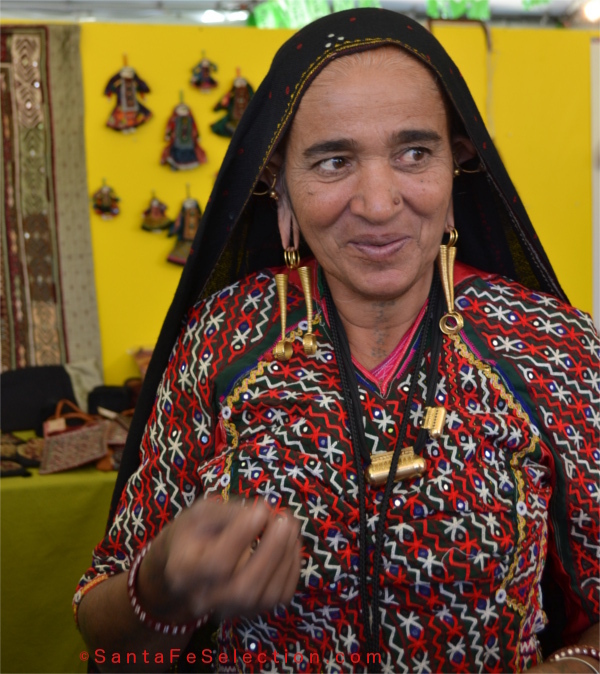 India – Meghuben Rabari- Embroidered applique, patchwork shawls, bags, dolls, wall hangings & accessories. 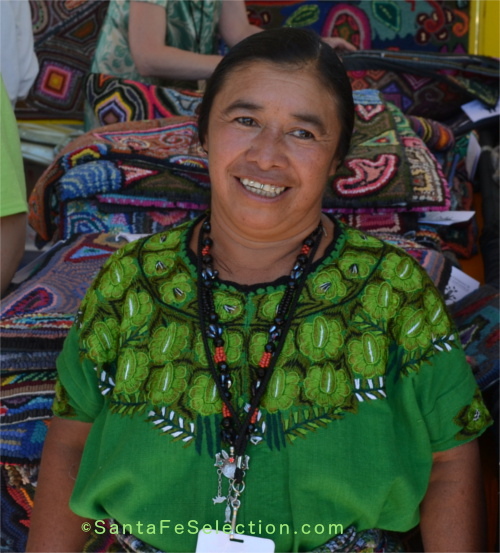 Guatamala – Carmen Maldonado Garcia – Hooked rugs with traditional Mayan and alfombras designs. 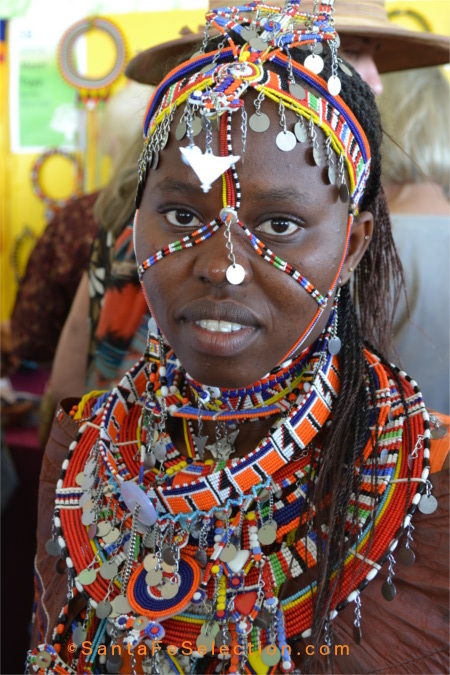 Kenya – Maasai bead jewelry, beaded clothing and accessories. Israel- Naama Al Sana. 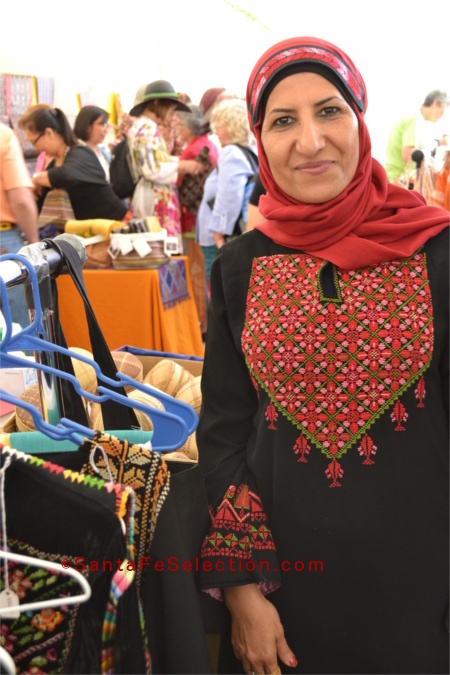 Negev Bedouin embroidered dresses, bags and home accessories. 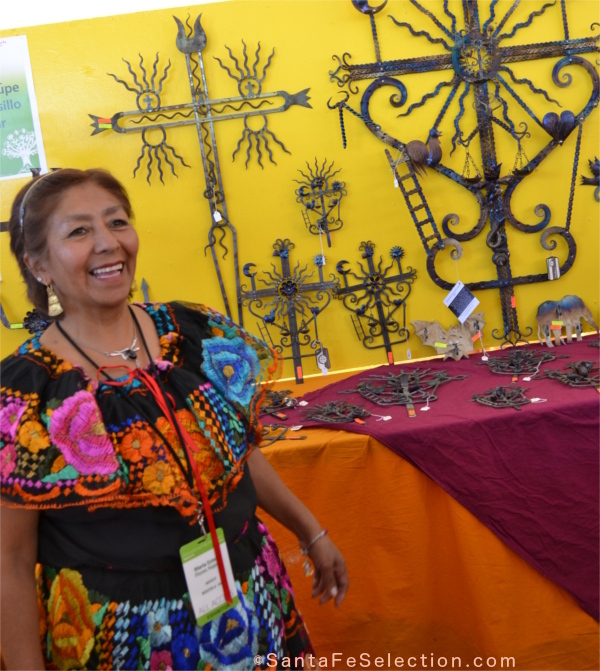 Mexico – Guadalupe Hermosillo Escobar: Forged metal roof crosses of San Cristobal de las Casas, Chiapas. 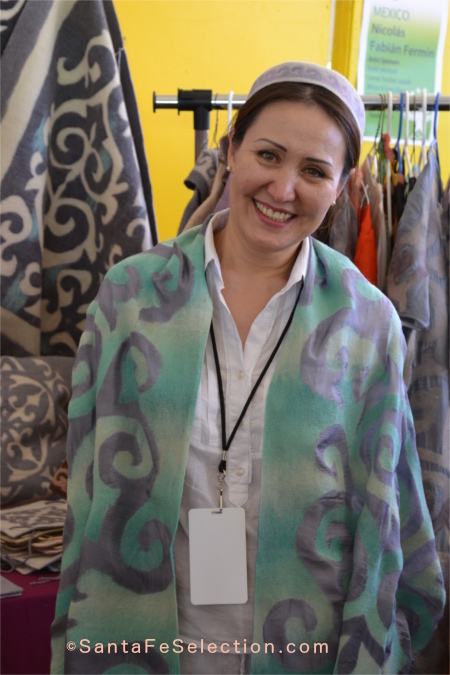 Kazakhstan – Aigul Zhanserikova – Works of wool felt and silk, pillows, scarves, bags and clothing. 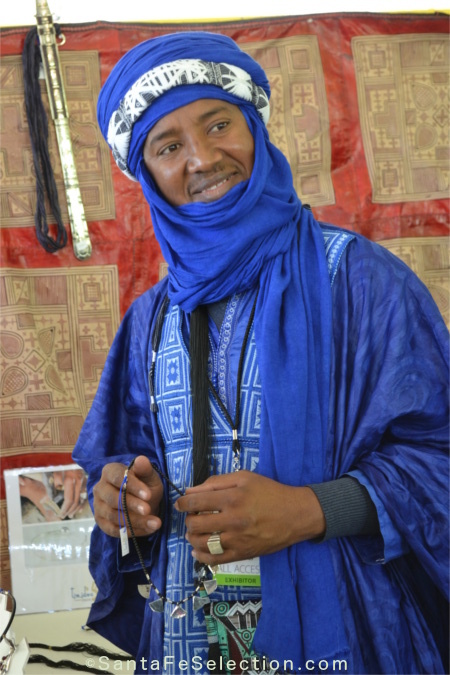 Mali – Mohamed El Maouloud Ag Hamid: Sterling silver Tuareg jewelry and leather boxes. Spain- Jewelry of silver filagre and pendants of tiny dried flowers. 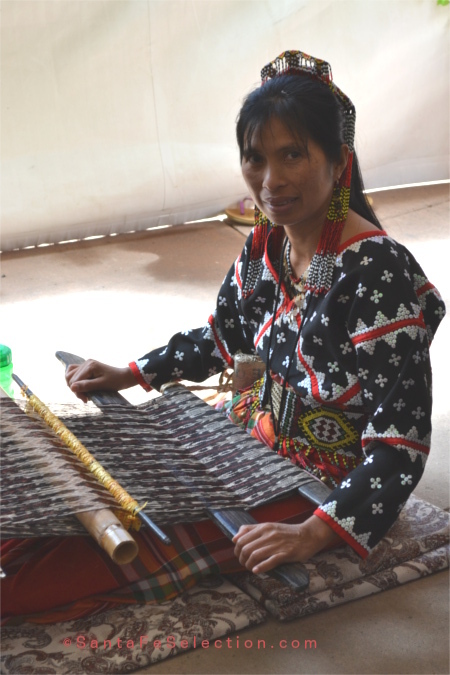 Lao PDR – Tai Lue, Katu and Phoutai textiles; Yao Mien embroideries. Nigeria – Handmade leather cushions, bags, accessories. 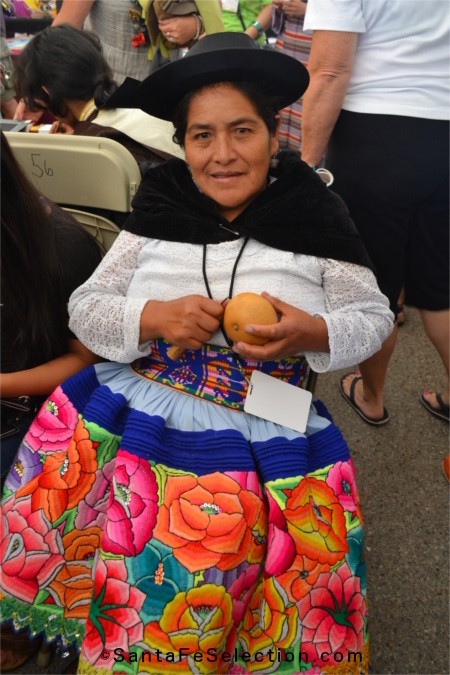 Peru – Hand carved gourds. Timor-Leste, Indonesia. Woven textiles, clothing, scarves and boxes. 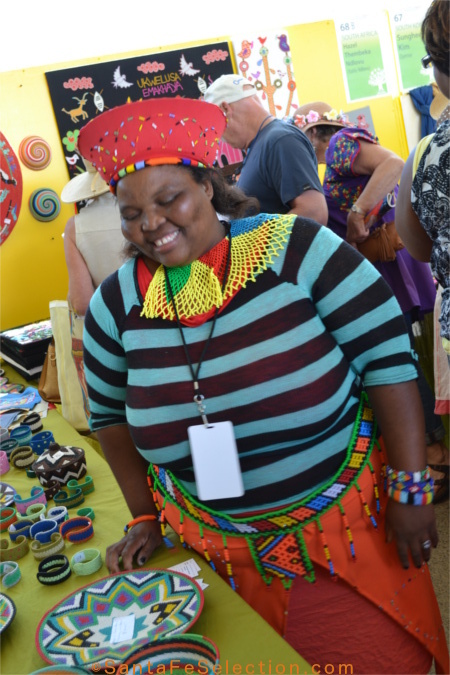 South Africa – Nomvuselelo LadyPeace Mavundla: Creates accessories, baskets and bowls using colorful telephone wire. 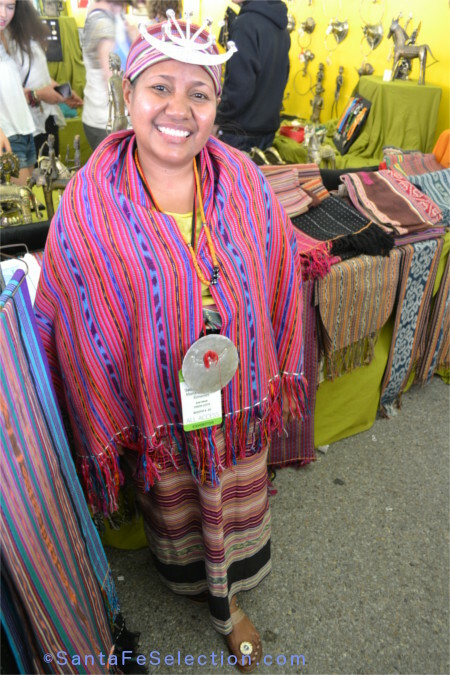 Mexico – Silvia Medina Hernandez. 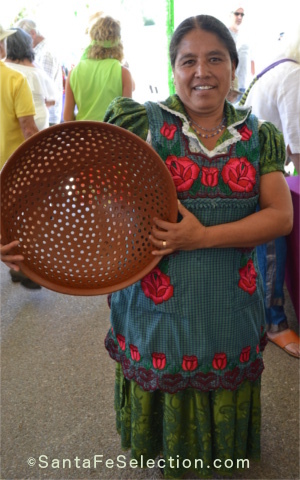 Clay bowls, vases & cookware. Philippines. 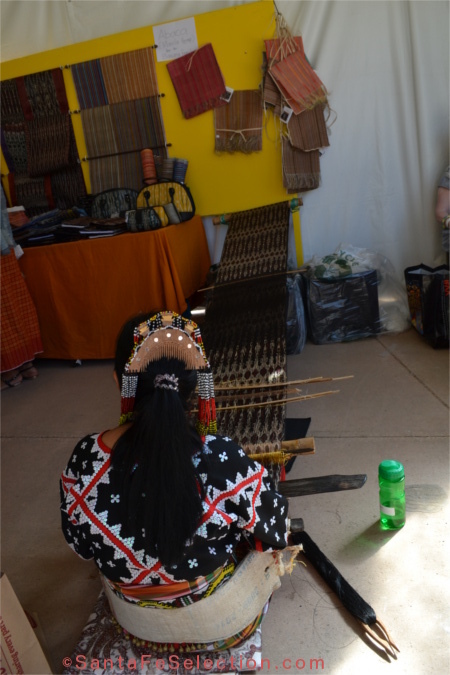 Backstrap loom weaving textiles. 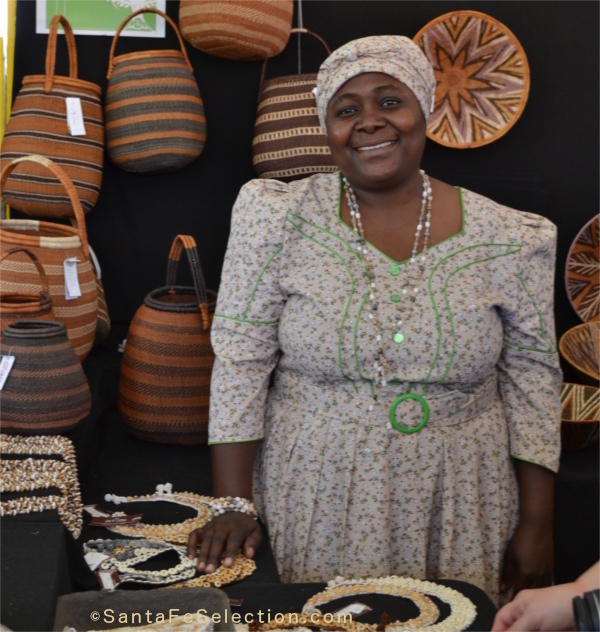 Namibia – Basketry, ostrich eggshell and PVC jewelry, and beaded art cloths. Tibet. 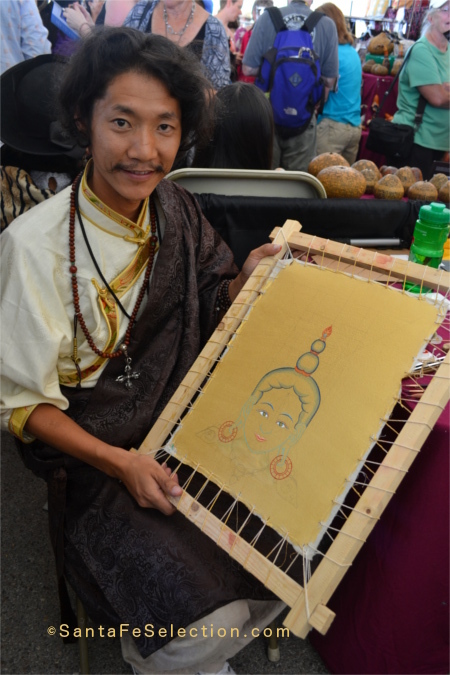 Kalsang Tashi holding a work in progress. Thangka paintings. 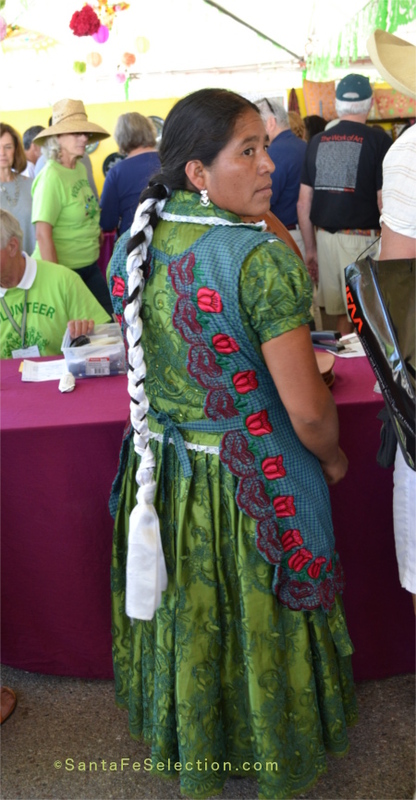 Huichol Indian, Mexico – Rosy Valadez, helping her brother, Rafael Cilau Valadez with his booth of Wixarika yarn paintings. This three-day event has grown in popularity since its beginnings in 2004. 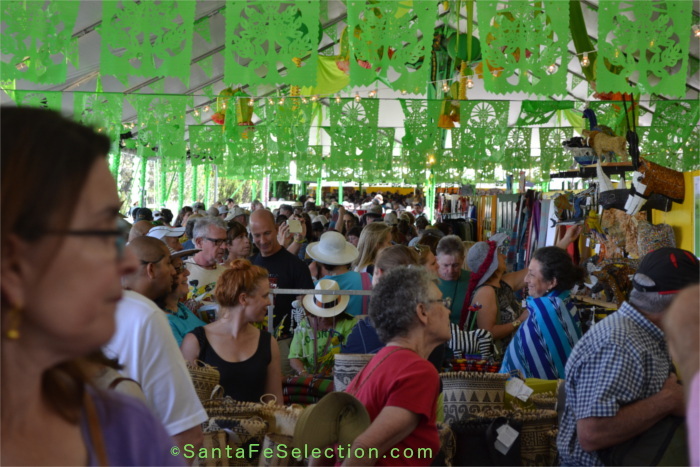 It is now one of the many wonderful annual markets and events happening during Santa Fe summers. 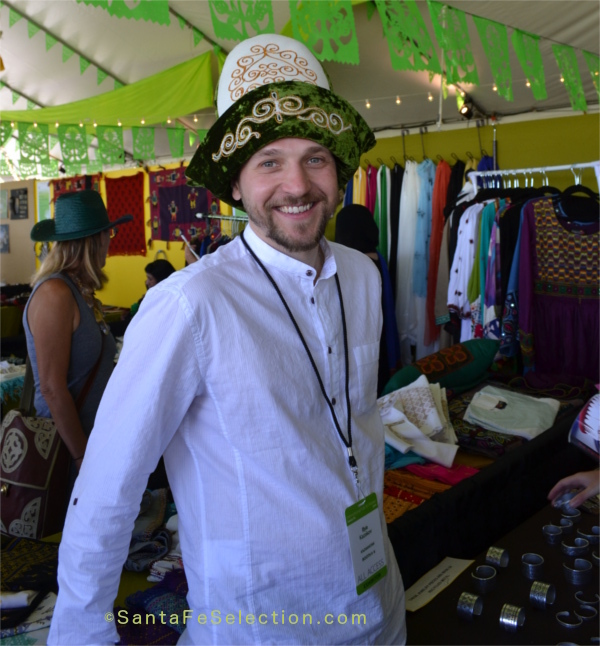 If you’re planning to visit the International Folk Art Market in Santa Fe, be sure to get your tickets in advance, if you can. They usually go on sale in early May via their website, and the Folk Art Alliance recommend booking through the website as the preferred method to ensure you have tickets. It is usually held the second weekend in July, but check this link for current dates, more info and for the link to purchase tickets. I also recommend you book your hotel rooms as early as you can. Click this link for a list of preferred lodging. If you need any assistance finding the right lodging for your needs and budget, you may contact me directly at the email and phone number below. 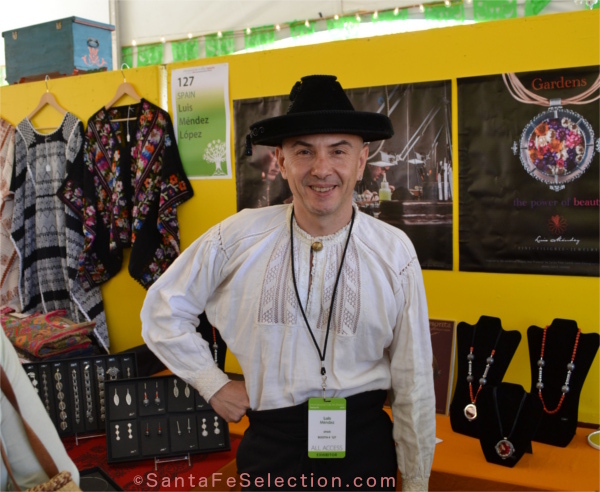 If you have any questions about visiting Santa Fe, please email me: info@SantaFeSelection.com, or call (505) 470-2991. Or go to our Travel Guide at SantaFeSelection.com to access easy maps, tips and ideas to help you plan your visit. Thank you for reading this post! If you would like to receive my monthly articles, please go to the home page and enter your email in the “subscribe” field. See you in Santa Fe! !